Definitive economic realities and trends are lining up with Bible predictions of the way things will be at the end of the age. One specific, powerful dynamic is driving all of mankind toward the end of days abyss Jesus called great tribulation. John the revelator gave, through inspiration directly from Jesus Christ, prophecy about the state of the economy of planet earth during history’s most terrible time.’And when he had opened the third seal, I heard the third beast say, Come and see. And I beheld, and lo a black horse; and he that sat on him had a pair of balances in his hand. And I heard a voice in the midst of the four beasts say, A measure of wheat for a penny, and three measures of barley for a penny; and see thou hurt not the oil and the wine’ (Rev. 6:5-6). The foreboding call for the rider on the black horse to gallop forth foretells a coming time of world-wide famine’of death from starvation for millions. There will be, at the same time, great riches. The wine will flow sumptuously, and there will be plenty of medicinal and other of life’s soothing emollients for living luxuriantly. However, the prophecy indicates a catastrophic division of the haves from the have-nots. The rich will get richer and want for nothing, while the rest of the world goes deeper into earth history’s blackest hour of depression. If this generation is within the general time-frame of the era just before Christ’s Second Coming, then we who believe in the Bible as God’s inerrant Word are assured we can see the signals of the season leading up to the end. Jesus said, as recorded in Mark 13: 37, “What I say to one, I say unto all, watch.” He said further: “When all of these things begin to come to pass, then look up, and lift up your head, for your redemption draweth nigh” (Lk. 21:28). So, with the Lord of creation the infallible prognosticator of what will happen from here to eternity, let us examine His end-time Word on earth’s economic future. And, keep in mind that the whole Word of God is Jesus speaking to us. The Scripture tells us, ‘In the beginning was the Word, and the Word was with God, and the Word was God. The same was in the beginning with God’ (John 1:1-2). It is Jesus, who is God, who gave all prophetic truth about what will happen in the end of days to the prophets of His Holy Word. Prophecy comes from Jesus, no matter what Bible writer or what Book we look at, while we think upon things involving end-time economy. With this fact in our thinking, let’s consider the thought expressed when we began. One specific, powerful dynamic is driving all of mankind toward the end-of-days abyss Jesus called great tribulation. It is becoming more and more evident what that component of the end-time economic puzzle is ‘oil. Petroleum is tugging, driving, causing all of mankind to rush toward the Middle East for the final showdown with Jesus Christ, himself. Rapture Ready has a number of articles on Armageddon and oil, with many books ‘both religious and secular– having dealt with the topic in past and recent times. Therefore, I want to, rather than look only at oil as an energy-producing resource, break down all of the peripheral issues associated with petroleum–i.e., we will look at that specific catalyst for bringing the armies of earth to do battle in the valley of Jezreel in its many component parts of the influence oil is exerting, particularly as involves economic pressures upon the nation-states of the world during these waning days of human history. The prophet Ezekiel gives us in a capsule the end-time economic factor that is the nucleus of the movement toward Armageddon. ‘Thus saith the Lord GOD; It shall also come to pass, that at the same time shall things come into thy mind, and thou shalt think an evil thought: And thou shalt say, I will go up to the land of unwalled villages; I will go to them that are at rest, that dwell safely, all of them dwelling without walls, and having neither bars nor gates, To take a spoil, and to take a prey; to turn thine hand upon the desolate places that are now inhabited, and upon the people that are gathered out of the nations, which have gotten cattle and goods, that dwell in the midst of the land’ (Ezek. 38:10-12). This is a prophecy of the Gog-Magog war scheduled for times just ahead. Some prophecy students believe it might take place before the rapture, some believe it might coincide with the rapture, and still others believe the Gog-Magog assault into the Middle East toward Israel could take place within Daniel’s 70th week ‘the tribulation. It isn’t particularly relevant to be concerned with the timing of that catastrophic attack here. But, it is most relevant to consider the particular thing that might cause the leader of this great force to have his ‘evil thought,’ and determine to bring that tremendous coalition of Israel-hating armies from the north. I believe it is becoming increasingly clear what that factor will likely be. Oil is the one commodity on planet earth that could reach the degree of importance that could constitute the ‘great spoil’ mentioned a number of times in the Gog-Magog attack foretold by Ezekiel. It cannot be mere coincidence that the Middle East region is where the planet was most lush–the place where the Garden of Eden was placed. If oil is, as most scientists believe, primarily decayed vegetation and animal matter that has decomposed, then this is the area where we might expect the greatest deposits of the substance we call oil. It must be more than mere coincidence, too, it follows, that this is the general region where all of the petroleum hungry nations of the world would place intense interest. How much of a stretch is it, then, to believe that the forces of Gog-Magog would one day consider this region a chief target for invasion? And, carrying this logic to biblically prophetic conclusion, is it any wonder that Armageddon, involving most every nation on earth, will meet in this very region to do battle for the great spoil ‘the liquid black gold beneath the sand of the Middle East? Ezekiel prophesied that God would ‘put hooks’ in Gog’s jaws and bring him into the region for the Magog forces’ destruction. God said He will gather all armies of the world to the place called Armageddon. Seems to me the gathering process is well underway, as we consider matters involved in end-time economy. ‘Men shall run to and fro, and knowledge shall be increased’ (Dan.12:4). Such great explosion of travel requires massive amounts of energy, and knowledge has increased to keep pace. The drain on crude oil resources and upon refineries has increased almost as exponentially as has the knowledge needed to produce the modern marvels of transportation in which we run to and fro. The one painfully obvious area in which this generation has not made stupendous achievement is in the area of creating viable alternate energy to that available through fossil fuels. New, thirsty customers plus diminishing supply = trouble of the apocalyptic kind. We will look at the newest customers lining up at the diminishing petroleum pools. But, first, let us think a bit upon how oil has an impact on life just in America. America, the greatest producer of technologies that assured the tremendous progress made within the centuries immediately past continues to be the world’s greatest drain on oil resources around the world. America was the producer for most of its own energy needs during the era of the mid-20th century. The vast, easy to access oil reserves in Texas and Oklahoma gave the nation a cheap supply of energy to run the machinery of the nation’s burgeoning demands. The depletion of those fields and subsequent search for new oil suppliers moved the U.S. and the world into geopolitical channels that few foresaw. America and the world –ever since being struck by the epiphany that, indeed, oil is a finite resource–have been powerfully drawn to the Middle East . So many rearrangements have taken place since the late 1950s that it would require a set of volumes on the things involved, not a single article, to cover the matter. The bottom line to consider is that the rearrangements that have taken place have all revolved around America’s relationship to God’s chosen nation ‘ Israel . The relationship has seemed both a blessing and a curse. America ‘s acting as midwife for the birth of modern Israel opened new venues of economic markets. U.S. protection of the infant state, which quickly became the most powerful in the region ‘with America ‘s help’gave the U.S. presence in the region of planet earth with the deepest petroleum reserves. These were needed to assure the powerful engines of western productivity would continue to run. The geopolitical and industrial realities of the times assured America a place among the chief players of the region with the clout to keep oil flowing. The royal Saudi family held the keys to the most copious amounts of the black gold. They needed ‘and need to this very moment’ America ‘s powerful military protection. All we have to do is recall the 1990-91 ‘Desert Storm’ conflict to realize that truth. Kuwait fell, and Saudi Arabia would likely be next but for America’s intervention. The rearrangements have proven to be a mutual, indispensable matter for both partners. Although the two cultures are in total conflict, survival exigencies demand a continuing and quite strong relationship. The security arrangements have brought forth, at the same time, strange bedfellow-type situations. One recently reared its troubling head, when America and the Saudis announced the likelihood that the U.S. will be selling advanced weaponry to Saudi for the purposes of their protection. While this is a fantastic economic boon for the American arms industry, it is potentially a slash in the joined-at-the-hip relationship between America and Israel . The royal family of Saud must have America ‘s strength to survive, even with increased military capability of their own. The Arab nations are indeed composed of wild men at even the top echelons of power. Most of them are tied inexorably to the beasts that direct the terrorist organizations of the Middle East. One example is Syrian dictator Bashar Al Assad, who permits every major terrorist organization of the region to headquarter in Damascus. Every one of the organizations is dedicated ‘because of ancient hatreds and Islam–to removing Israel and her closest ally, America, from the Middle East. They hate the Saud royal family also, considering them as in league with the infidels ‘all who are not fully in compliance with the laws of the Koran. Israel looks with discomfort at the American/Saudi relationship, and becomes quite nervous with the thought that the most advanced and sophisticated weaponry on the planet might be placed in the hands of Muslims. End-time economic matters come even more into focus when thinking upon the newest players in the dangerous game of who controls the petroleum pools of the Mid-East and the world. The price of oil continues to edge upward, while a newly awakened industrial monster steps to drink from earth’s black, liquid pools in order to satiate its growing thirst. China, the oldest civilization on earth, has a population of 1.3 billion and rising. That makes it about five times the size, population wise, of the United States. It has the world’s second-largest economy, and, according to experts, is growing, economically, at a rate four times faster than that of America. China has 22 percent of the world’s population, but only 7 percent of earth’s land mass. This, considering that nation’s rate of growth, and reputation for aggressive behavior, does not bode well for a peaceful future for planet earth. This is true, in part, because less than 10 percent of China’s land is farmable. The arable land is reported to be declining at somewhere around 750 thousand acres per year due to urbanization, erosion, and other factors. They will almost certainly look more and more to their north and west for expansion. Look for this expansionist mindset from China’s leadership to be the source for rumors of war over the coming years. The nation’s growth means its energy needs are mushrooming. China is already the largest user of oil next to the United States, with their need for petroleum having risen more than 50 percent within the past decade. This speaks directly to the end-time economy that is developing. It is the almost unbelievable demand for oil that portends a coming crisis of frightening proportion. The petroleum industry will simply be unable to keep up with the demands of the nations, whose industrial needs are even now accelerating out of control. Added to the great demand for petroleum by China is that nation’s workforce that has tasted the milk and honey of industrial growth, and will have nothing less. Since the collective farms and the land were returned to the people to a considerable extent in 1978, the peasant’s economic condition has improved, according to some experts, by more than 1500 percent. Millions upon millions of Chinese citizens enjoy western luxuries such as television sets, computers, and many other items. They have come from walking or riding broken-down bicycles through poverty-stricken countryside villages, to driving automobiles upon superhighways in a growing number of large cities. All of this ‘progress’ has come, and continues to move forward at the expense of the western economies ‘particularly that of the United States of America . Estimates are that by 2030 China will be 60 percent urbanized in the most modern sense of the word. Tens of millions of Chinese are flocking to the cities. Shanghai, for example, is already eight times the size of New York City in population. Their average per capita income has risen from pennies per day at best, to $1000 per year. This seems trivial to Americans and Europeans of the west, but that growth represents astonishing industrial dynamics that have begun to deleteriously affect the western economies. Chief among the nations affected is America, who is losing in some key technology production areas to China. America is already in a vulnerable position, its dollar having fallen to near all-time lows against the rest of the world. And now, the economic climate for Americans themselves is getting ugly. In tough times, what will be the priority of politicians? Keeping voters happy? Lower oil prices? Or continuing to support Israel? Unfortunately, this last policy will prove to be mutually exclusive with the other objectives. 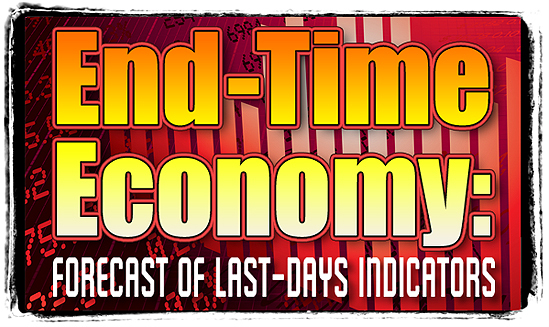 We have considered mostly the United States and China to this point, in thinking on the end-time economy and a likely forecast for the future in terms of financial indicators. This is altogether proper, because, no doubt about it, China represents the greatest challenge to the western industrialized world. China’s enormous need for petroleum plus its exploding demands for goods of every sort is affecting world markets in ways that are draining on the economies of the rest of the world. China will, it is forecast by top economic authorities, have within 20 years the largest economy in the world. That nation currently uses 2500 tons of coal per minute. They use 24 million watts of electricity per minute, and 240 thousand barrels of crude oil per minute. Extrapolated to its net effect, one economic observer says China is growing at such a rate of usage of natural resources, that within 30 years it will require another planet earth to meet its needs. China’s ratio of income from America to outflow of money to the U.S. is staggering in its implications. Fifty billion dollars annually –that’s more than $150 million per day’currently flows from America to China. China has attracted more foreign investment capital in five years than Japan has in the 50 years since World War II. That nation holds, according to one economic authority, so much of America ‘s debt instruments that if China sold those into the world market, America would be bankrupt in about 17 minutes. The bottom line of all these troubling things about the great dragon nation is that economy has suddenly vaulted it to a powerful position on the world stage. It is oil that powers its massively growing industry, just as it is oil that fuels the industry of America and other western countries. It is economic force that is driving all of these players to a showdown at some future point. God’s Word calls that showdown Armageddon. When the end time volcano blows, rearrangements will take place at a quantum rate, as America scrambles to regain fiscal equilibrium and societal/cultural balance. I’m more and more convinced that the top will explode from the volcano when the rapture of the Church occurs. Many things will have to take place immediately. Conditions will demand it. America’s tax base will be in shambles, and ways to reorder the nation’s revenue production will be sought and secured.Martial Law and draconian means might have to be employed to assure compliance by citizenry. Since millions of American workers that provided the heart of the tax base will have disappeared, the nation’s leadership will likely seek immediate new rearrangements with Europe, which will not be so gravely affected. New, electronic funds transfer monetary devices will be created to deal with immediate needs in the financial market places. Dynamic rearrangements with Middle Eastern dictatorships will be sought in order to secure continued oil flow to the west. This will be absolutely essential, because of the refusal for decades by western world leaders to forge ahead with new exploration for fossil fuel, or research to find and produce alternate fuels. Israel will come into play in the end time economic rearrangements. The Arab nations, headed by Israel-hating Islamic fanatics will make demands the West will have little choice but to accept, if the oil is to continue to flow in a westerly direction. Ultimately, oil will become such a concern for all world players that all will consider black gold worth a third world war. Not a pleasant forecast, right? To the contrary! A very pleasant prospect, not for the present world at large, but for those who look for the King of Kings and Lord of Lords to return and institute a new, supernaturally-infused economy for Christ’s 1000-year reign upon this reclaimed planet.